Dan is starting his ninth year at The Crosswinds Golf Cub as the teaching professional. Dan has worked for some of the finest teachers before coming to Crosswinds. He worked at Oyster Harbors Club for five years and subsequently worked for the president of the PGA at the Jonathan’s Landing Club in Jupiter Florida. 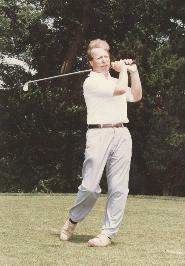 He was head professional at Pembroke Country Club from 1991 to 1994. Dan brings enthusiasm and over 20 years of experience to the lesson tee. Private lessons Individual instruction is the most effective means of improving a golfer’s game. Private lessons are an ideal way to establish a long term learning relationship with one instructor. For the golfer who has playing experience but, has reached a plateau. This is a very flexible program which can be tailored to your specific needs. Because the agenda is designed specially for you, this program is available to individuals only. For those who have never played or had professional instruction. Learn the basics of the game in a fun atmosphere. This is a four week program, one hour per week. Your group can pick the day and time. Dan will be happy to build a program to fit the group. Junior classes consist of(4) one hour lessons designed specifically to introduce golf to young people. Learning to play golf should be fun and that’s what our program is all about. It is a fun way to learn the game. It encourages young golfers to reach their full potential. Pre registration is required. Sign up for one of our classes or arrange a group of your own. This program is for players who have experience and are playing competitive golf or trying out for high school teams. On select Sundays during the season, Dan offers a Free Clinic at 1:00 PM. The clinics are designed for players of all abilities. Each clinic will deal with a particular phase of the game, as well as matters of general interest. (See schedule of topics below.) We invite your questions and participation during these clinics and hope you’ll get into the act! Come as often as you like, no sign up is necessary.